Posted 10/11/2016 11:31am by Eric and Amy Philson. Our farm has been in a whirlwind the last few weeks preparing for and manning a booth at Clarion's Autumn Leaf Festival and then Franklin Applefest. This was our first time at both of these festivals, and we had a warm welcome from the attendees. Our booth was in the same spot occupied by Brown's Pure Maple for several years, so many came to find Brown's quality maple products. Jim and Darlene have been graciously mentoring us this year as we jump into maple production following our purchase of their business at their retirement. The biggest hit of the festivals was our newest product: Bourbon Barrel Aged Maple Syrup. After trying a sample, most people had to take a bottle home for themselves or to give as gifts. We are co-branding the syrup with Wigle Whiskey, a small-batch distiller in Pittsburgh. As soon as they empty bourbon barrels, we fill them with hot maple syrup and let it age for several months. We then filter and heat the syrup, removing the impurities and residual alcohol. What is left is a bourbon-infused maple syrup that is out of this world. Wigle is also carrying our product in their stores. We have an historical link to this product. Wigle Whiskey is named for Philip Wigle, who was sentenced to hang in the Whiskey Rebellion. If you're not familiar with this part of history, let me briefly tell you the story. Farmers on the western frontier (at that time western PA, West Virginia, western New York, etc.) had a difficult time transporting their grain harvest to markets on the east coast. The roads were poor, and their grain often molded in the damp climate before they could sell it. So they turned it into whiskey, which was easier to transport. Congress decided to tax this whiskey as a way to raise much-needed funds for the new government. However, western farmers rebelled against this new tax, pitting them against George Washington's troops. Eventually, Washington's troops returned home and the tax was repealed, but not without some minor skirmishes. Wigle was one of the instigators of the Whiskey Rebellion, along with Robert Philson, an ancestor of our family. Now we are taking the Whiskey Rebellion to a sweet new level with our Bourbon Barrel Aged Maple Syrup. If you haven't tried it, you don't know what you're missing! Contact us at contact@bushelandpeckfarm.com to get your own bottle. 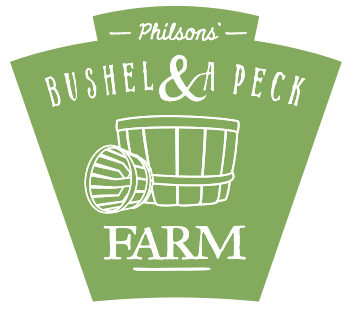 All content property of Philsons' Bushel and a Peck Farm.